First, a crazy definition is read to the group e.g. 'The planet where old socks do'. 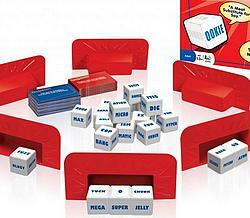 Next, players use the wacky word parts to create wildly funny new words to fit the definition. Each new word is read out loud, and the 'Wordmeister' picks the best one! Faux-Cabulary — it's where new words come from!